We have all visited those awe-inspiring gardens that seem to be designed to perfection. Season after season, they offer beauty, layers upon layers of color, texture, form and interest. While it’s easy to see that those gardens are lovely, figuring out how to create such beauty in your own yard is another, much more challenging matter. 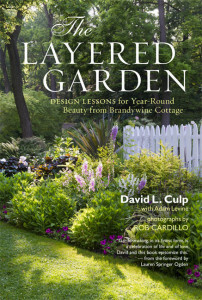 In this new book, The Layered Garden, written with Adam Levine and photographed by Rob Cardillo, Culp takes gardeners through his design process and explains how to apply it to your own garden. He shows how beds relate to each other and to the garden as a whole, how groundcovers, mid-sized plants, vines, trees and screening plants are used to define layers within the garden and how techniques such as repeating plants and colors, even plants within the same genus that have different bloom times, can add impact to the garden. His workshop for both creating and explaining layered gardening is his 2-acre property, Brandywine Cottage, located near the fringe of a suburban development (though you would never know that because of the garden design.) The concepts of layering are visible in the stunning color photographs throughout the book. Especially helpful are shots of the same area in different moments, such as two photos of a rock-edged hillside taken three weeks apart in spring. One shows lots of bare earth with swaths of white daffodils in bloom. In the later photograph, hostas, heucheras and other plants have emerged and lilacs are now in bloom well behind the daffodils, which have finished their blooming. If you are faced with a blank-slate property, Culp offers many suggestions for slowly developing a garden, giving the land a chance to reveal itself as you figure out what the best garden for you will be. If you are planning to design or redesign a space next spring and summer, this is a wonderful guide to choose. Would you like a copy of The Layered Garden? Leave a comment below about your favorite plant combinations and we’ll enter your name in the drawing. The winner will be announced Dec. 26.